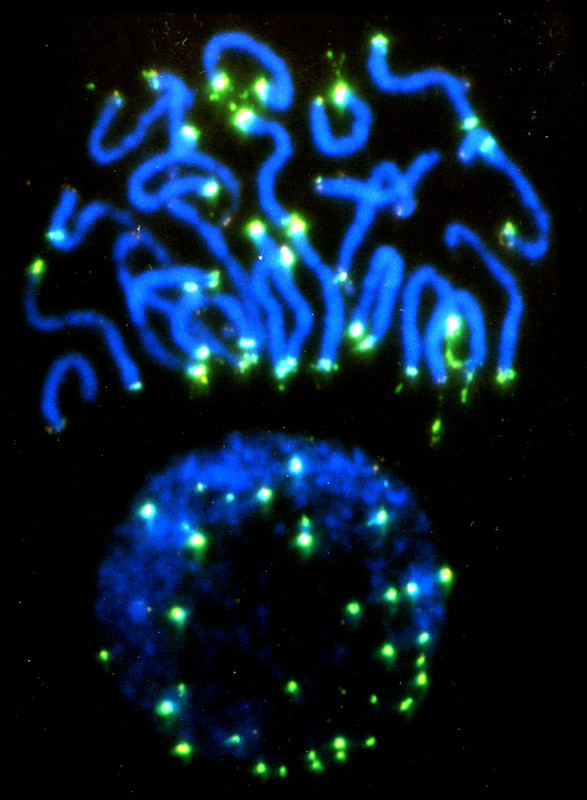 Telomeres are the ends of eukaryotic chromosomes associated with their stabilization and to reverse losses of DNA associated with incomplete end replication. We are interested in the evolution of plant telomere motifs. In particular we showed that in the divergence of the plant order Asparagales, the telomere motif (TTTAGGG)n, that is thought typical of plants was replaced with a (TTAGGG)n motif, more usually associated with vertebrates. We also showed that with the divergence of Allium (onion), this new TTAGGG-type motif was itself replaced by another, as yet unknown telomere motif. We also found that in the plant family Solanaceae, a group of closely related genera, Cestrum, Sessia and Vestia, also lost the TTTAGGG-type telomere motif, and the sequence that replaced it is also unknown. In collaboration with Dr Jiri Fajkus and his group, we are studying the evolution of plant telomeres. If you are interested in research in this area, please contact me. For further reading, please see:Fajkus J, Sykorova E, Leitch AR. 2005. Telomeres in evolution and evolution of telomeres. Chromosome Research 13(5): 469-479.